Palazzo Naiadi is part of the Dedica Anthology, Autograph Collection, and is located in the Piazza della Repubblica, in the very heart of Rome. It’s situated in one of the most impressive locations in the city, and perfect for exploring the sights and taking in some of the storied history this wonderful city has to offer. The impressive arched façade of the hotel is a sight to behold, especially at night as it’s well-lit and stands tall in the dark night sky. As soon as we arrived a small army of staff appeared to assist us. The car doors opened and our luggage was whisked off and we were walked through to reception for a prompt and friendly check-in. 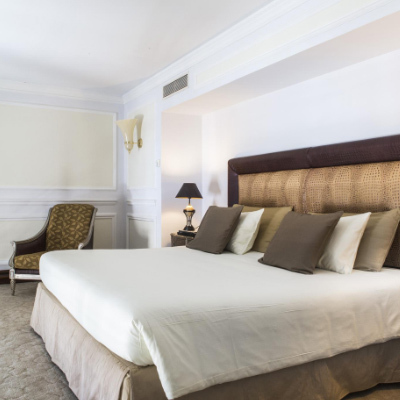 During our stay, we had the pleasure of experiencing one of their Duplex Junior Suites. The word “Junior” is really understating what this suite has to offer, which is very rare but most welcome. The moment we stepped foot into the suite we were taken back by how huge and beautifully furnished it was. 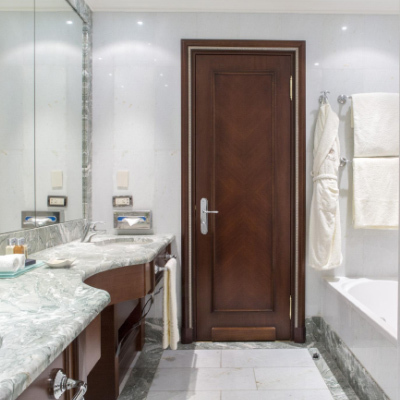 The décor is neoclassical and regal, with relaxing beiges and creme colours, offset with touches of gold and marble. The suite covers two floors, with the living area and bathroom on the lower level, and the bedroom on the upper. The main living area comprised of a large sofa, coffee table, the most charming armchairs, and a number of interesting ornaments and pieces of art. There was also a good sized desk which is ideal for those looking to catch up on some work. The bathroom was complete with his and hers wash basins, a separate walk-in drench-style shower, a bath, and of course a toilet. Finished with a lovely marble and highly polished fixtures. 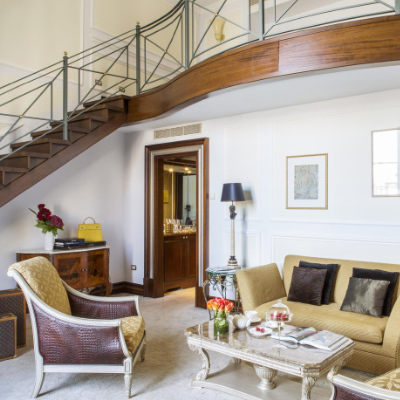 An open staircase on one side of the suite lead us up to an open-plan bedroom area overlooking the living area. The bed was very comfortable and had a large, plush headboard. We have to mention the huge windows that stretch the height of the suite. 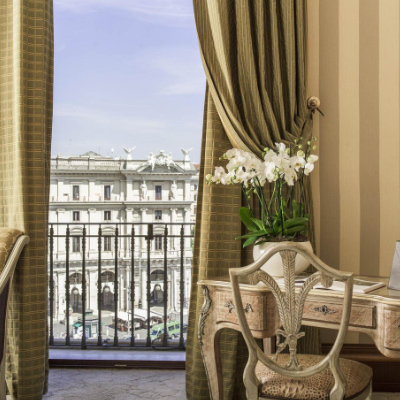 Both allowing plenty of natural light to fill the suite and offering impressive views out over the Piazza della Repubblica and the magnificent fountains. We recommend taking in the views as day turns to night, it’s really an impressive sight. For dining, you are treated to stunning views over the Vatican and a number of historic landmarks while dining high above the city at the aptly named, “Posh Terrace.” A visit to the elegant Lobby Bar is also a must, here you’ll find the perfect cocktail accompanied by soft jazz music to set the tone for a wonderful evening. We also recommend experiencing their spa facilities. 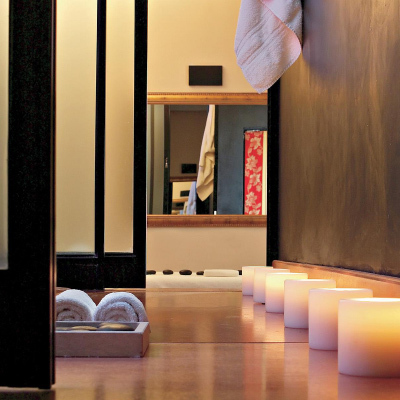 With six treatment rooms and a range of therapies, a steam room, jacuzzi, gym, and an open-air pool on the rooftop, there is something for everyone looking to relax or workout. 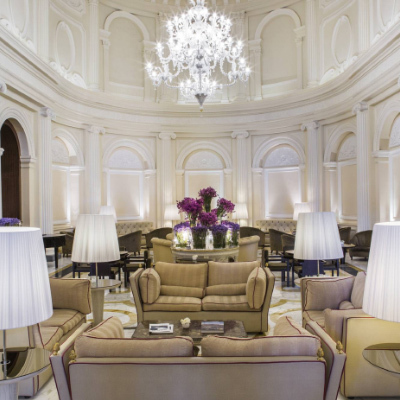 The Palazzo Naiadi is a true five star experience in the heart of Rome. We were left wanting for nothing and the city gave us so much. We cannot fault any part of our experience and thoroughly enjoyed every minute we were there.